Barrett-Jackson held their 11th annual Palm Beach auction this past weekend, and while the docket didn’t have quite the lineup of Mustangs as their Scottsdale event back in January, there was some pretty impressive sheet metal up for grabs. One particular standout is a recently restored 1968 Shelby GT500 Convertible that commanded a final price of $330,000, the highest amount paid for any non-charity vehicle at the auction. So what makes this particular Shelby so valuable? For starters, just 402 were built in 1968, and this example is one of the best with a numbers-matching powertrain and a three year restoration under its belt. The car has won numerous awards since including a 98.6% score and a “Gold Level” at the SAAC national event last year. You can read more and view images of the car below courtesy of Barrett-Jackson. One of only 402 Shelby GT500 convertibles built in the 1968 model year. This early 1968 Shelby was built 11/25/67 and is shown as it “left the factory.” It is equipped with the powerful 428cid Police Interceptor V8 engine, optional C6 automatic transmission and matching numbers drivetrain. This solid and rust-free Shelby was restored by Shelby experts over a three year period with the restoration finishing in 2009. Costs were not considered when restoring this car as the goal of the owner was to restore this Shelby to the highest level of authenticity. The Shelby was restored to show and drive like new using the best parts and researching historic photos, judging rules and the original Build Sheet. The 428 engine was rebuilt by John Callis of ROUSH Yates Engines in North Carolina. The Shelby was finished in original factory color of Acapulco Blue with the correct black décor and white convertible top. Features include factory power steering, power front disc brakes, unique Shelby shoulder harnesses, AM radio and Marchal fog lamps. The factory original wheels and hubcaps are present and additionally a restored set of original 1968 Shelby 10 spoke wheels are included with the sale. The restored Shelby debuted in April 2009 at the Mustang Club of America 45th Anniversary held in Birmingham, AL. The Shelby received 1st Place out of all 1965-1970 Shelbys judged. Since then the car has been stored at Orland Mustang and has received constant maintenance and improvements between national shows and judging by the best Shelby experts in the country. The Shelby won 98.6% of judging points and received “Gold Level” at the 37th Annual Shelby America Auto Club (SAAC) National held at Watkins Glen, NY in 2012 scoring 795.5 out of 807 points after five judges spent over two hours judging. The Shelby was also awarded “Gold Level” at SAAC 36 at Virginia International Raceway in 2011. In addition, the car was awarded “Diamond Level” at the Team Shelby Nationals held in Tulsa, OK in 2012, It was awarded “Gold Level” four times at all attended Mustang Club of America National and Grand National shows from May 2011 to July 2012. This Shelby GT500 won seven awards including five Best in Class or Show at various Concours D’Elegance shows including Hilton Head, SC, Boca Raton, FL, Poconos, PA, Winter Park, FL and Lakeland, FL going back to October 2009. 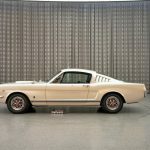 This entry was written by by MustangsDaily (Mustangs Daily) and posted here on Tuesday, April 9th, 2013 at 7:31 am and is filed under 1968 shelby gt500, 1968 shelby gt500 convertible, auctions, barrett-jackson, News, shelby, shelby gt500 convertible. This article was not written by us, rather gathered using RSS feeds listed here. We take no credit for this article. You can leave a response, or trackback from your own site.